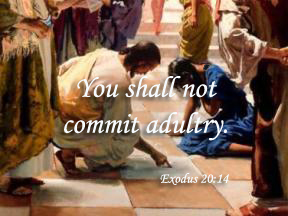 "Thou shalt not commit adultery" Exodus 20:14. "Whoso looketh on a woman to lust after her, hath committed adultery with her already in his heart" Matthew 5:28. Jesus made it clear in the New Testament that even visual adultery is sin. ..."eyes full of adultery, that cannot cease from sin" II Peter 2:14. Paul warned the Corinthians to "flee fornication" I Corinthians 6:18. We are living in an age where sin is portrayed as a mere illness of the body or mind; when sin is denied or laughed off, when sin is rationalized as merely doing one's own thing, or doing what comes naturally. But a belief in the Holy God and respect for the authority of his word demands that adultery be recognized and acknowledged for what it is . . . sin. "Whosoever shall put away his wife, saving for the cause of fornication, causeth her to commit adultery. And whosoever marry her that is divorced, committeth adultery" Matthew 5:32. "For this ye know, that no whoremonger, nor unclean person, nor covetous man, who is an idolater, hath any inheritance in the kingdom of Christ and of God." And in Colossians 3:6, we are told that because fornication, uncleanness, and inordinate affection, the wrath of God comes on the children of disobedience. Verses like this reflect the importance of the Biblical moral law. The Biblical moral law is fulfilled by love. The subject of adultery and marriage and divorce are closely related. A portion of the Mosaic Law permits an Israelite to divorce a wife he had taken from a captive nation simply because he was, not pleased with her, (vs. 14). This might seem like a rather loose permission. But note well that, for that Biblical era, this was God’s Word! God cannot be shown in the Bible to be 100 percent against divorce in all circumstances. However, be assured: I am not remotely implying that God is permissive concerning divorce! To the contrary, Malachi 2:16 declares: I hate divorce, says the LORD God of Israel. "How then can I do this great wickedness and sin against God?" Genesis 39:9.